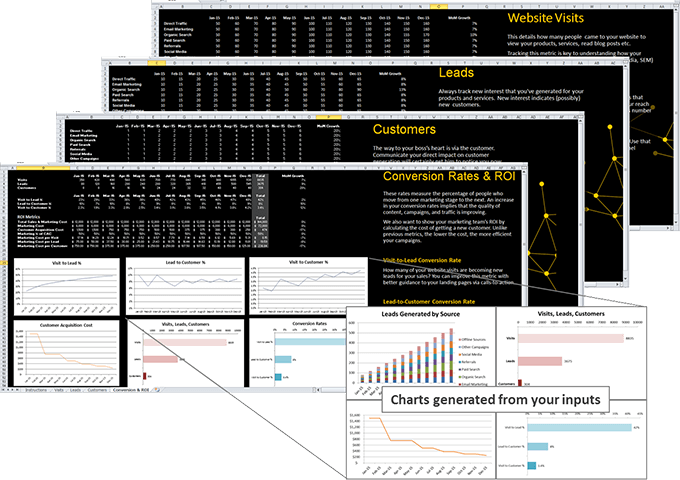 What if you had a report that tracked the metrics that matter, automatically calculated your Marketing ROI, and generated charts for presentations? Built in Excel, it structures your reports so that you know what data to track and, more importantly, automatically calculates and generates charts to show the effectiveness of your campaigns over time. This template is for bosses who demand business ROI metrics, too! Calculate the Customer Acquisition Cost of your campaigns from your digital metrics such as visits, leads, and customers. Impress with your marketing cost per visit, lead, and customer.